Pudding Lane in London is very well known for the “Great Fire of London”, which happened in 1666. It was within this particular lane where the devastating fire broke out and the event is now marked with an incredible monument. In 2016, marking the 350th year anniversary of the catastrophic occurrence, a new luxury bar opened, right in the monument’s shadow: Ember. Having been in the capital ourselves recently gave us the opportunity to be graced with a fine dining experience at the luxurious venue. What a pleasure it was! Here at Café Reality, we are of course huge furniture and interior fanatics, especially at restaurants! 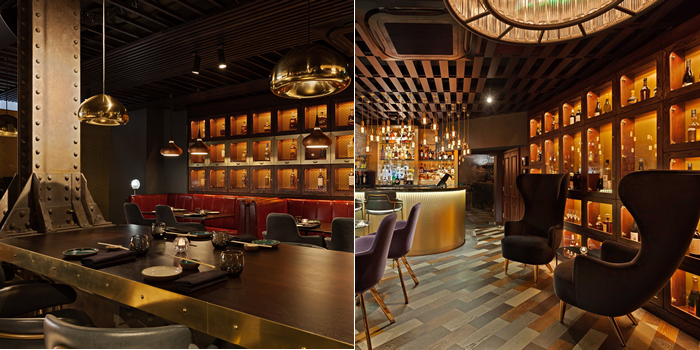 We were truly in awe of the fantastic interior of Ember and were all blown away by the fabulous culinary delights. The stunning interior, designed by Ross McNally (founder of “Scarinish Studio”) is breathtakingly beautiful. The main foundation of the dining and bar space has focussed on the raw elements of the basement area in which the restaurant is based. Exposed beams and columns create a “raw” industrial look. Keeping the substructure elements exposed with a dark tint reflects the finish of “charcoal”- a reference to the heritage of the location where the venue is based. The focus on the past is strengthened by the furniture and fittings that have been incorporated within the dining, lounge and bar areas. The seating and light features, most of which are designed by Tom Dixon, highlight the desired theme using natural materials such as copper and leather. Copper light fittings suspend subtly from the dark, exposed ceiling creating an intimate and soothing atmosphere. Along the side walls, booth seating (upholstered in red leather) has been installed. The combination between the subtle light, copper glimmer and red shades increase the intimate environment, all offering a finer dining experience that becomes very personal. Subdued lighting glimmers from shelving units that have been set into the walls. The compartments where bottles of wine and liquor are displayed are surrounded by copper frames, allowing for light to “flicker” when a shadow passes. The shades given is very much like the light that is given off by a candle. The use of copper and glistening lights continue right through the room where we were seated, reaching the main bar. The counter becomes a striking centrepiece, one that you can’t take your eyes off. Elements of the same style and materials presented in the room create the masterpiece that is simply spectacular. In the champagne lounge, there are splashes of green and subtle purple shades that make up the seating areas, together with copper chair legs. All these colours within the room are reflective to the colours that you will find within dancing flames. 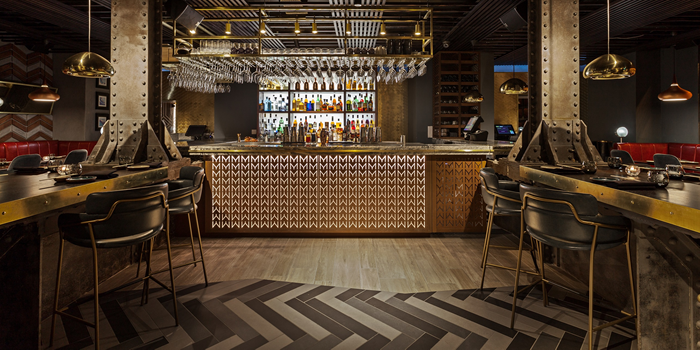 Overall, throughout the venue, the colours of the raw foundations and furniture are reminiscent of the shades you will find in recently charred wood, hence the name “Ember”. Furthermore, almost like a wild blaze, the theme of the Great Fire spreads throughout the splendid premises, right up to how the delightful menu courses are presented. Bright coloured dishes, created with exotic spices and creative ingredients, are all Asian inspired. They are all very different and simply delicious. One of the dishes was even served in a copper dish, matching the copper cutlery, showing the exquisite attention to detail within the restaurant experience. 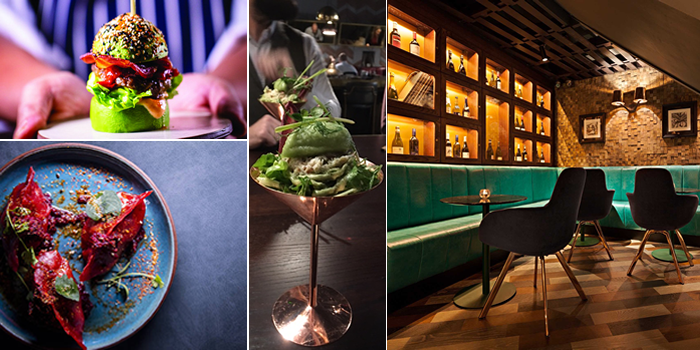 “Ember” is not only a fantastic place to enjoy a delicious cocktail and fabulous meal. It is also a place that reflects our national heritage, our culture and is a true example of fine interior design. Dedicated not only to respect its location, but also committed to offer an unforgettable experience. Certainly an event that I will never forget.